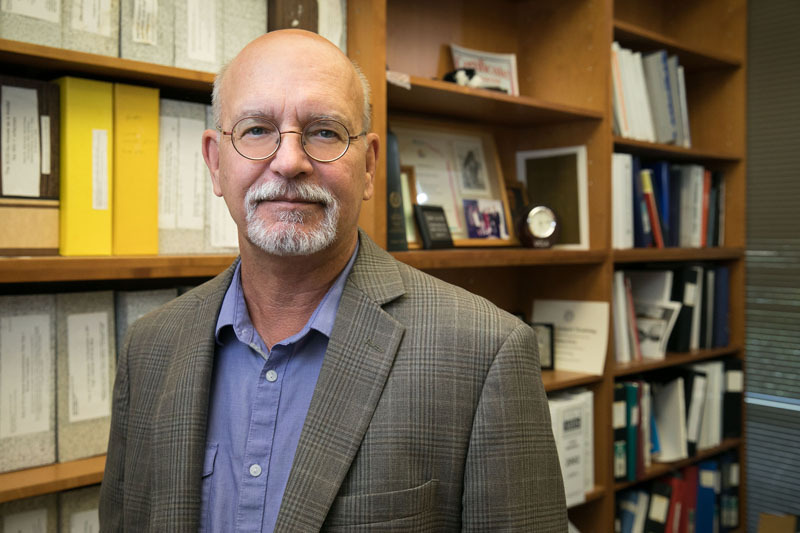 Jerome Zack, Ph.D., studies how the human immunodeficiency virus, or HIV, replicates and causes disease in order to inform the development of new therapeutic approaches to treat or cure HIV/AIDS. Once HIV invades the body, it targets the very immune cells that are working against it, using the machinery of these immune cells – called T cells – to make copies of itself to spread. This kills the T cells and weakens the immune system so much that the body cannot fight off infections including viruses that cause cancer. Zack aims to address this problem head-on by genetically manipulating the immune system to provide increased protection from HIV. He and his collaborators are developing a gene therapy method that equips blood-forming stem cells – which can give rise to all blood cells, including white blood cells, red blood cells, and T cells – with a specialized molecule called a chimeric antigen receptor (CAR). This CAR enables the blood-forming stem cells to produce T cells that can locate and kill HIV-infected cells. In pre-clinical studies, these CAR-carrying blood-forming stem cells successfully generated a long-lasting supply of T cells that were able to kill HIV-infected cells in animal models. Zack and his team are continuing to test this method to determine if it could be used to treat people with HIV. Zack is also developing methods that would use patient blood-forming stem cells, induced pluripotent stem cells or embryonic stem cells to generate immune cells called natural killer cells in a dish in the lab. These natural killer cells would then be infused into the patient's body where they would find and kill HIV-infected cells. Zack conducts his research using HIV-infected mice that have been transplanted with human immune systems. His lab has spent more than 25 years refining these animal models to make them more useful to the field of HIV research. Using these mouse models, Zack also investigates methods to prevent HIV rebound after a patient stops taking antiretroviral drugs. While these drugs enable many people infected with HIV to control their virus levels and stay relatively healthy, they do not actually rid the body of the virus, which eludes medications by remaining hidden in a dormant form in certain cells. When a person with HIV stops treatment, the virus emerges from these hiding places and replicates, weakening the immune system and increasing that person’s risk of succumbing to an infection or cancer. Zack and his collaborators developed a synthetic molecule that can “wake up” or activate the dormant virus while the patient is still on medication, which causes it to begin replicating so that either the immune system or the virus – under the influence of the antiretroviral drugs – can kill the HIV-infected cells. The team is now conducting further studies to determine if this approach could be translated to treat people with HIV. Zack earned a doctorate in immunology from the University of Texas Health Science Center, Dallas, and completed post-doctoral training in virology at the UCLA David Geffen School of Medicine. Zack’s research is funded by the National Institute of Allergy and Infectious Diseases and the California Institute for Regenerative Medicine. Human stem cells can be genetically engineered into HIV-fighting cells, according to a study by scientists with the Eli and Edythe Center of Regenerative Medicine and Stem Cell Research at UCLA Scott G. Kitchen and Jerome Zack. Dr. Jerome Zack, Associate Director, UCLA AIDS Institute, professor of Medicine, Microbiology, Immunology & Molecular Genetics, and researcher with the BSCRC at UCLA discusses creating induced pluripotent stem (iPS) cells.